Mars Global Surveyor was a new kind of spacecraft: built "faster, better, cheaper." 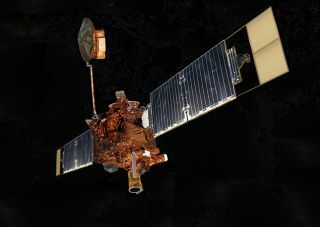 Mars Global Surveyor was a spacecraft that produced data about the Red Planet that will keep researchers busy for some time. Launched in 1996, the orbiter found intriguing hints of running water and confirmed that the famous "Face of Mars" was a trick of the light. Unfortunately, NASA lost contact with Mars Global Surveyor (MGS) in 2006. MGS was the first NASA spacecraft to reach Mars in almost 20 years, since the Viking missions arrived in 1976. Right from MGS's first moments at Mars, it was a pioneer: it was the first spacecraft at the Red Planet to use the technique of aerobraking to put itself into its final orbit. It was also part of a new concept for building spacecraft after a series of cost overruns and unsuccessful missions. Soon after reaching orbit, MGS set about generating a great deal of science. It spotted gullies that could have had streams of water rushing through in the ancient past. It snapped pictures of a "Swiss-cheese-like" south pole, and it watched dust devils leaving tracks in the Martian surface. It spotted hematite – a mineral that forms in water. And it took detailed photographs of the infamous "Face on Mars." When the Spirit and Opportunity rovers reached Mars in 2004, the spacecraft also served as a communications relay for the rovers to send data back to Earth until it fell silent in 2006. MGS had been born out of the failure of a previous planned Mars mission. Mars Observer, launched in 1992, was just three days from its planned orbit insertion around the Red Planet when NASA lost contact with it on Aug. 21, 1993. The failure stung, particularly because flight delays and other matters had nearly quadrupled the projected cost for Mars Observer. "Originally budgeted at $212 million, Mars Observer wound up costing $813 million," NASA's Jet Propulsion Laboratory noted in a brief history about the mission. "By the time it was launched on Sept. 25, 1992, Mars Observer had come to symbolize out-of-control costs." Under new administrator Daniel Goldin, NASA embarked on building a "faster, better, cheaper" (FBC) set of spacecraft. The concept was supposed to use small teams and less complicated components to build low-cost spacecraft. The program had a mix of successes and failures, but did birth the wildly popular Mars Pathfinder/Sojourner rover mission that landed in 1997. NASA started building cheaper spacecraft under the Mars Surveyor program. MGS – at just $154 million (excluding launch costs) in 1996 dollars – was to be the first of a series of spacecraft launching every 26 months. The Mars Surveyor concept was altered after two Mars spacecraft failed in 1998. MGS launched successfully on Nov. 7, 1996, on board a Delta II rocket. From its launch pad at the Kennedy Space Center, it bounded into orbit and then fired its engines again to accelerate towards Mars. Ten months later, on Sept. 12, 1997, MGS successfully made it into orbit at the Red Planet. To save on the cost of hauling fuel to Mars, mission planners used a new technique – aerobraking – to finalize MGS in its orbit around the planet. MGS pushed against the atmosphere gradually in its first several months at Mars to put itself in the final orbit. This technique proved so successful that it was used again for the Mars Reconnaissance Orbiter and Mars Odyssey missions. Mars Global Surveyor photographed the "Face on Mars" in greater detail. One of MGS' first targets was the "Face on Mars," an infamous feature snapped by the orbiting Viking 1 spacecraft on July 25, 1976. The shadows appeared to be a human face gazing up at the sky, which sparked a generation of conspiracy theories on Earth. MGS passed over the same location at the Cydonia region on April 5, 1998, to get a more detailed look. Although NASA already knew the "face" came from a trick of shadows, MGS' pictures were in higher-resolution and were used by the agency to debunk the theory. The European Space Agency confirmed the finding in pictures taken with Mars Express in 2001. NASA carefully selected its first targets to include areas of public interest. Other spots that MGS imaged in the early days included the Viking landing sites and the Mars Pathfinder landing site. Mars, revealed by MGS, was a rapidly changing planet that probably had a different environment in the past. Pictures in February 1998 showed a possible ancient river channel. Other snapshots over the years showed slowpoke dunes, regolift drifts and sandsheets on the surface, suggesting that wind was a big factor in shaping Mars history. As MGS skimmed the planet from pole to pole, it tracked changes in carbon dioxide ice deposits near the south pole of Mars. After three Martian summers of observations, data from MGS revealed that the deposits were shrinking – a possible indication of climate change. The spacecraft mapped Martian terrain with a laser altimeter, detected traces of magnetic fields with its magnetometer, and mapped at least 20 new impact craters between the time it started operations and the time it fell silent. When MGS spotted hematite – a mineral that forms in water – from orbit, the discovery spurred NASA to land the Opportunity rover in a hematite-rich area. Just weeks after landing, Opportunity found hematite "blueberries" just a short distance from where it touched down in Meridiani Planum. MGS lasted four times longer than its design lifetime, but the end came rather unexpectedly. On Nov. 2, 2006, controllers ordered MGS to shift its solar panels – a routine adjustment. The spacecraft reported back several errors, but the transmission also indicated that things had stabilized. Then MGS fell silent. "The spacecraft reoriented to an angle that exposed one of two batteries carried on the spacecraft to direct sunlight," read a NASA press release describing the most likely cause of the failure. "This caused the battery to overheat and ultimately led to the depletion of both batteries. Incorrect antenna pointing prevented the orbiter from telling controllers its status, and its programmed safety response did not include making sure the spacecraft orientation was thermally safe." NASA tried for weeks to get in touch with the dead spacecraft, with no success. An independent review board determined that the MGS team did follow the correct procedures to help the spacecraft, but added that the procedures themselves were not strong enough to "catch the errors that occurred". The agency pledged it would overhaul its procedures to improve other Mars missions. Indeed, NASA has since had more success in resurrecting spacecraft that had software problems. A notable example is the Mars Odyssey mission, which has entered safe mode several times but been successfully recovered. Odyssey, as a side note, is currently the longest-running Mars mission with more than a decade in service. But it was MGS that got there first, and that paved the way for more Mars missions to follow. The spacecraft kickstarted a new age of Martian exploration, and provided the first detailed look at the Red Planet in a generation. Although MGS' mission is long over, there still are occasional science results publicized in the media. For example, in March 2016 NASA released an improved gravity map of Mars that in part used data from MGS. The goal of the map is to better understand variations in the Red Planet's gravity to track the geological history of Mars, such as the differences between the northern lowlands and the southern highlands. In 2013, researchers suggested that Eden Patera, previously believed to be a crater basin, may instead be remnants of an ancient supervolcano. Based on data in part from MGS, researchers noted a lack of ejecta debris in the region as well as features that usuallly point to volcanism, such as "bathtub rings" created when lava recedes from the area.